2700 enough for my needs? Discussion in 'AMD Processors' started by Westwood Arrakis, Mar 20, 2019. All I'm really doing right now is 1080p gaming. Mostly Path of Exile with a bunch of tabs open. Now and then I'll play Far Cry for a bit. Nothing major. I've got way too many things going on right now to veg out gaming. I wanted to get a 2700x, but for $300, this deal is hard to pass up. I'll have to get some ram, a cooler, and Win10. That will set me up just fine. I'm coming from an older rig; 3470, 1060 6gb, Win7, etc. So I'm sure at this point anything really is an upgrade. Wow, that’s an awesome deal! It will certainly meet your needs for 1080p. I have a similar set up (but w/ a first gen Ryzen) and I wouldn’t change a thing. mmk. It also comes with Division 2 which I have zero desire to play, so I'd sell that off for cheap. LightsOut41, Sulphademus and drescherjm like this. Anyone know by chance if this board will work right off the bat without a BIOS update? Link no longer works for me. What board was included? I figure get this bundle, Corsair Vengeance ram for $105, sell the Div 2 code, pickup a cheapo Win10 key, and run it. Like, $400 total to update the system. oops, read your post wrong. X370's don't support 2nd Gen Ryzens off the bat without a BIOS update. Assuming it has an old BIOS in, this particular model won't be able to flash the BIOS without a compatible CPU in it, and you may have to send it back. HOWEVER, since it is being sold as a bundle, it is *likely* that these are sporting a new version of the BIOS. I could be wrong though. Given the price, it's worth a shot. I could just download the update onto a flashdrive and use that though, correct? hrm. 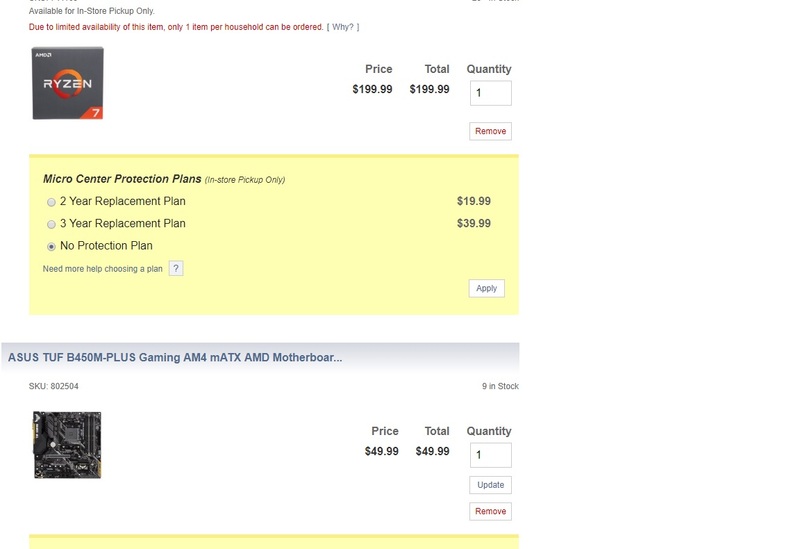 wonder if its worth a shot calling NewEgg to find out. Sorry, I get like 15% of building a system. I'm like two steps above buying a setup at Best Buy. "Supports AMD Ryzen 1st & 2nd Generation/ Ryzen 2000 Series / AMD 7th Generation A-series/ Athlon processors"
Does this board have support for Ryzen 2000 chips out of the box or do I need to update the bios first? I don't have another CPU to install first to update the bios. BEST ANSWER: Check with Gigabyte on this specific board but the 300 series does need to be updated to support 2nd gen Ryzen processors. Many mfgs make this very easy by providing update servers that UEFI BIOS can connect to directly before you ever boot your OS, so not a deal breaker but definitely find out if it needs to be done on your end. The X370 has slightly better features (ie better onboard sound card) than the B450, but the B450 is a slightly newer platform and should do more DIMMs at higher frequencies better (based on what I'm reading). If you plan to run only 2 sticks of memory at less than 3400mt, the X370 should be fine. Otherwise, for a $10 diff, it's a wash.
Re: the above post, not sure about the internet connectivity prior to boot. I too haven't built a personal system in years.. What I do know is that if this is going to happen, it has to happen prior to POST, since unsupported CPUs will yield a no POST. If I were you, I'd just order it and send back the board for them to flash it if the board won't recognize the CPU. huh. they would do that? Maybe pricing varies by location? I'll call them on my lunchbreak. I guess I can put in a request for them to flash the board before it ships? Iunno, we'll see. I've got Sven in NewEgg chat looking this up for me. I'll report back with results. ok. there's my answer. the board will require a BIOS update before the CPU will work. I can contact AMD and they can send me an update kit. I think I'll pass on the deal then. Just still with the 2700x like I had planned. On X370 platform I would certainly double check the ram you are using if it is on the Gigabyte QVL if not you might run into troubles either running it on set speed or just other problems. Yea, the more I look this deal over the more I'm satisfied with holding off. Couple nuances that I really don't want to have to deal with. 2700x comes with a solid cooler fyi. Mind that 2700 is supposed to come with its own cooler. That some more bucks saved if you don't overclocked. But graphics card is not cheap. My opinion is this is normal price the Gigabyte X370 Gaming 3 is not a great x370 card. I'd rather get a B350m Asus motherboard and save a lot more, and a Ryzen 2600 which is fair enough (the cores run a little higher but are 6 with 12 threads only). As long as they produce the same lower pricing on newegg or elsewhere. Mind that the Ryzen 1 and + CPU are going to have their price dropped, especially the Ryzen 2000 (Ryzen+) series when Ryzen 3000 are going to be announced.